As I removed my tap shoes and sat down to write this article, I thought, “What is the most important thing I’d like my readers to get from this article?” Well, obviously, I would wish for you all to fall in love with tap dance. I know, I know, that’s quite a lofty goal, but maybe if you’d get a standing ovation with a tap piece, you’ll embrace tap with a healthy respect. It is a truly American genre (now danced worldwide), and it’s a joy and a challenge to create music while you dance. To quote an old phrase: “It’s a treat to beat your feet!” It is my personal hope that rather than recycling the tap of the past, we can keep what is valuable from bygone eras and endeavor to take tap forward in an effective, energetic and entertaining way. One of your first considerations is to assess the purpose and demographics of the performance for which the piece will be performed. Is it a concert, or a recital, or a commercial setting (such as a showroom or a theme park), or a competition? And what kind of audience would you have: 60 people, or 600, or 2,000? And what is the age span? In addition, is the piece a solo, a small group or a larger production? All of these considerations will guide you in making one of your most important decisions – your choice of music. Coppola Rhythm Ensemble. Photo by Sergio Minero. In choosing music, you should choose music that your audience can relate to, that they can attach to and enjoy the groove with the dancers. That doesn’t mean predictable; it’s good to have a few surprises or highlights in the piece, both audibly and visually. Your simplest consideration in choosing music is: Can the audience hear the taps? And that means all the way at the back of the theatre. Music that’s too heavily orchestrated will smother the taps. Also, check out the acoustics in the theatre. In preparing your dancers, I’ll assume that the level of tap technique is adequate to support the choreography. Young dancers should be in a class that includes a healthy dose of technique. A class which only works on a routine short-changes the dancers; they will have less substance to put into a dance. As a judge, I often see tap pieces which include several dancers who do not execute all the sounds. Make sure each dancer can do the steps alone and a cappella. Then when you reassemble the dance it will be stronger. So now that you’re married to the music, it’s wise to create a theme – a series of steps or a phrase that’s recognizable when it is reprised. It is the signature of the piece, and it should grab the audience both audibly and visually and show the character of the piece. Tap’s musicality can be applied to many styles, from traditional hoofing to Latin, to rap, to blues, classical, to rock and show tunes. Unison: never underestimate the value of unison. A good step laid down in perfect synchronization is very satisfying to people. It’s a valuable technique to spread out various rhythms and return to unison for a dynamic punch. An entire dance done in unison can be boring. Canon: Canon, or presenting rhythms in a round, can be very effective. It works for duos, groups and lines. Have several of the dancers start a choreographic phrase, and then have the other dancers start the same phrase later. How much later? Eight counts is pretty safe, but four counts is very effective (assuming the music is in straight, or 4/4, time). If you separate by only two counts, it can sound like a mistake to the audience, like botched unison. Counterpoint: This refers to two rhythms sounding at the same time. Canon will automatically produce counterpoint, but you may want to create two different tap idioms complementing each other. Be careful – if the steps are too busy, it will just sound cluttered. Leave spaces. Single sounds are valuable. Tap is conversational. Just like verbal language, it needs inflection, causes, punctuation and emphasis. Don’t let it become a run-on sentence. Trades: So if tap is conversational, it lends itself to back-and-forth as in question-and-answer. A literal trade would be where one dancer (or group) lays down a rhythm, and the second group repeats the rhythm verbatim, usually trading either eight counts or four counts. A more conversational approach is to vary the second rhythm (the answer). Often the second rhythm is trying to outdo the first. Dynamics: I can’t help but notice the lack of dynamics (degrees of volume). It takes more than just “banging out steps”. A cappella tap is a great opportunity to use some very soft and quiet choreography; it will force the audience to listen closely. Then you can rebound with something aggressive. Contrast is very valuable musicality. It’s also effective to contrast the difference between direct rhythms (on the beat) and syncopated (off-beat). Since tap sounds are mostly staccato, you can get sustained sounds with a myriad of slides and nerve taps used like a drum roll. The visual imperative: If you have blazing fast feet (you can start fires on the floor with your feet), it’s not enough! Rapid fire sounds may be impressive, but without something visual happening the audience will be bored sooner rather than later (not to mention that the audience may not grasp the new ounces in a blur of sound). We live in a time when, due to technology, quick cuts and editing, and social media, people’s attention span and our concentration and focus will follow that which moves. But before delving into staging, it’s wise to look at the visual energy of the individual dancer. A high energy dancer should get upper body energy by “selling the step” – putting emphasis on the body; the arms, unless specific, will usually follow the torque in the torso. I am very fortunate that in my tap ensemble here in Las Vegas, my pro dancers are high energy; I rarely have to choreograph port de bras (arm movements). This is conducive to the feeling of a “jam”. It’s an advantage if the dancers are versed in other genres, and it is often reflected in their carriage and port de bras. Upper body movement of the head, arms and torso can help you emphasize and pick up the accents in the music. Also, use of levels doesn’t only mean levels of the set pieces. The individual dancer can use the floor and the air to create levels. One of the things I’ve seen in judging that really makes me cringe is tapping with the hands held behind the back. While you may think that it lets the dancers concentrate on the feet and gives it uniformity, it subtracts all the energy in the upper body and can become a bad habit. It’ll be more difficult to break that habit when you do need port de bras. When I see the hands held behind the back, it looks to me like the dancers got taken prisoner during their tap dance. One of my colleagues actually refers to it as “prisoner tap”. Mixed Genre: We touched upon drawing from other genres. I wish for my students to not just think upon themselves as tappers, but as tap dancers. The more versatile and well-rounded you are, the more choice you have to create effective, dynamic tap. Combining forms of dance gives you many options and catches the audience’s interest. I had success several years ago combining a cast of ballet dancers and tap dancers complementing each other and integrating motifs. We are in the time of hybrid dance forms, so take a chance. Stir a pot of “dance soup”. Staging: If you’ve created the steps, body lines and matching port de bras that compliments your music, now it’s time to stage it: to move the bodies around to create patterns, angles and enhance the energy of the piece. In decades past, dancers stayed in a particular formation for longer than in present time. We discussed the audience’s shorter attention span, so it’s fashionable and effective to change positions more often. How and when and why is the art of staging; there are so many choices. You can move the dancers downstage, upstage, laterally, diagonally, and up and down for levels. By moving the dancers, I mean dance them to the pattern – don’t walk or march them there. It’s dance, not drill team or military corps. Obviously, diagonal allows you a longer pass (and provides more interesting angles in the body). Opposition, dancers moving in opposite directions, creates a simple and effective choice. Staging the dancers in pairs lends itself to such tools as having the two “do-si-do” around each other, coming back to the original position. When choosing steps that travel, you’ll need to get dancers on the ball of the foot so they can “fly” like sprinters. At this point, it’s worth mentioning that if there are props in your dance, make sure the dancers can handle them gracefully without anything looking clumsy or cumbersome. If the props are stationary, it can work to create paths in and out, around, over and under, and on top of the props. This can also give you a variety in the pitch of the sounds that the steps lay down. Performance: I hope in a future article to discuss the value of the art of theatrics. 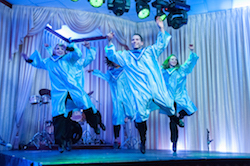 All of the elements for creating effective and entertaining tap must of course be performed to the max, with connection to the audience, strong and appropriate characterization with performers who relate to each other and command the stage…and wrapped up in a magical intangible called style! 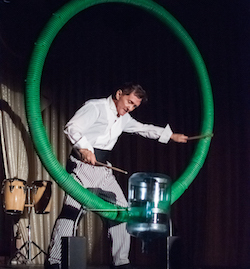 Tap master Tony Coppola is also a former All-American gymnast and a percussionist. He has taught at conventions and judged competitions for several decades. Tony directs and choreographs the Las Vegas-based Coppola Rhythm Ensemble. Photo (top): Coppola Rhythm Ensemble. Photo by Sergio Minero.